What happened to my corn and bean seeds? I was hoping to get around to planting snap beans last weekend. It didn’t happen. A co-worker planted a few rows last week and they are up and growing nicely despite the cool nights. Even with sufficiently warm soil (>55 degrees F.) beans that germinate must contend with erratic spring weather and birds that pluck sprouts from the ground. And I’m sure some gardeners will be dealing with the seedcorn maggot. The first time I grew a field of muskmelon I watched about 20% of my transplants mysteriously decline and die within weeks of planting. An Extension Specialist dug up a few of the affected transplants, cut the lower stems open with his pocketknife and showed me the culprit- seedcorn maggot. I was surrounded by fields in continuous corn and had spread manure the previous fall- two conditions favoring this common spring pest. The maggot burrows in and feeds on large seeds like bean and corn (lots of nutrients), potato pieces, seedlings and transplants. If they are present you will see spotty germination and stunted or dying plants. 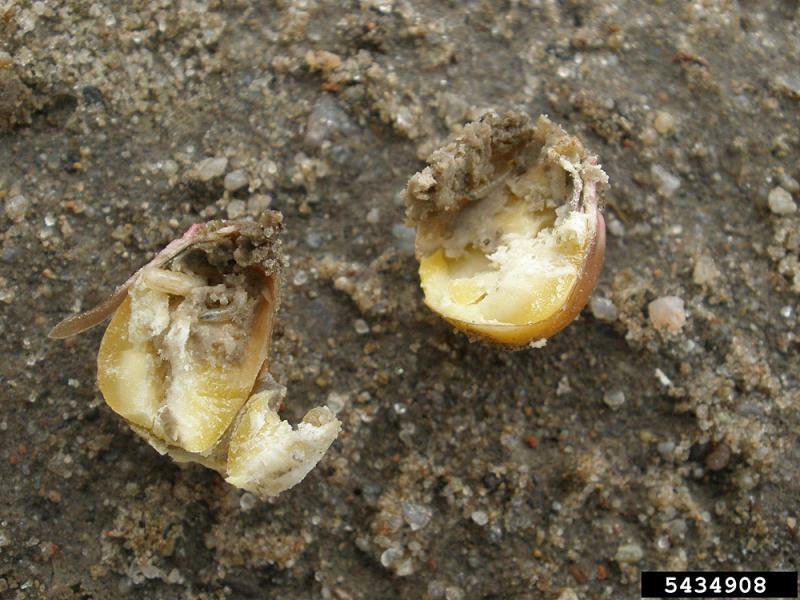 Seeds and plants need to be closely examined to determine if seedcorn maggot is at play. I suspect this pest is a more significant garden pest in rural areas. The Home and Garden Information Center gets more reports during cool, wet springs when bean and corn seeds are slow to germinate. Soil-borne insect pests can be difficult to manage (there are few insecticides available to home gardeners). For more photos and details on preventing problems go to the GIEI website. Wow, learn something everyday! I had no idea. Thank you so much Jon. Didn't have a problem with maggots but the frost we had earlier this week sure burned my potato foilage back. Typical spring weather warm enough to fool you into planting frost sensitive vegetables and then after you think you have a jump on the summer season, old man frost comes back.